If you run a Clenbuterol cycle of three weeks you should know how to schedule the daily doses. The schedule is made this way: on the first 3 days, you must start with a dose of 25 mcg per day. In the next 3 days, you must increase the dose up to 50 mcg per day. Other 3 days: the dose will increase up to 75 mcg per day. So, in the next 3 days the dose will be of 100 mcg per day. When you are at the middle of the cycle the daily doses will decrease from 3 to 3 days, until when in the last 3 days of the cycle you will take again just 25 mcg per day. As well, you can follow this schedule if you want a cycle of 4 or 5 weeks, but no more than 6. The only difference is that the dose will change at 4, 5 or at 6 days. Clenbuterol can be used with anabolic steroids if you want better results, but it’s not necessary. Clenbuterol Hydrochloride, often referred to simply as Clenbuterol or Clen, is synonymous with weight loss and slimming; and it is widely used by bodybuilders and people interested in losing weight. But what exactly is it and how do you use it? Clenbuterol is not a steroid as you might think, but rather a central nervous system (CNS) stimulant that is classified as a beta-2 sympathomimetic. Sympathomimetics, which include stimulant compounds like amphetamines, caffeine, albuterol, ephedrine, cocaine, and many others, are substances which mimic the effects of agonists of the sympathetic nervous system (SNS) such as dopamine, norepinephrine, catecholamines, etc. Though commonly used for Weight Loss and slimming purposes, this was not the original intent of creating this medication. Clen is actually a powerful bronchodilator, which is used to treat lung diseases. Its weight loss powers are a secondary trait, and emanate from its ability to stimulate thermogenesis. 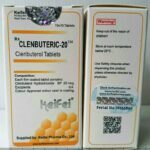 Clenbuterol mostly comes in 40 mcg tablets, but tablets and syrup versions of the drug are also available. Clenbuterol works by interacting with adrenoceptors (also called adrenergic receptors) in the body. There are two major classes of adrenoceptors. They are alpha- and beta-receptors. Within these two different types, there are nine subtypes. The effects of a sympathomimetic stimulant in the body are determined by how the compound interacts with these different subtypes of adrenoceptors found in different areas of the body. Different stimulant compounds have different capabilities when it comes to stimulating adrenoceptors. Some compounds can stimulate multiple subtypes whereas others may focus on just one subtype. Clenbuterol is particularly known for its high affinity for the beta-2 adrenoceptors (this is why it is referred to as a beta-2 receptor agonist), though it also does exhibit effects on other adrenoceptor subtypes. It is actually the most potent beta-2 receptor agonist available, and engages the beta-2 adrenergic receptor like no other. When the beta-2 adrenoceptors found within the fat tissue are stimulated by this drug, it leads to an increase in the body’s temperature – which, in turn, stimulates increased metabolic rate that causes fat burning. This ability to facilitate lypolysis (the breakdown of fat into free fatty acids) has seen it become a popular drug among bodybuilders, athletes, and even ordinary fitness enthusiasts. When used as a bronchodilator, Clen activates beta-2 receptors located in the cell lining of the bronchial tubes. This causes the airways to open and expand (bronchial dilation), helping relieve symptoms of lung disease and disorders like asthma. The drug is also used in the treatment of a variety of other conditions, such as anaphylactic shock, histamine reactions, allergic reactions and swelling, migraine headaches, heart arrhythmias, cardiovascular shock or slowdown, and hypertension. In these therapeutic settings, Clenbuterol is used in relatively low doses of 20mcg and only for a short period of time. But it’s worth noting that some patients may require higher doses of up to 40mcg, or even more. When administered in higher doses, Clen has a muscle-building (anabolic), and simultaneously, a fat-reducing effect. But, while the drug’s fat-reducing capabilities have been proven, whether or not it provides muscle- growth-promoting benefits is still debatable. Studies have shown that Clenbuterol promotes lean muscle growth in animals. However, many users often report little or no gains in lean muscle; and there’s no data to show that it promotes anabolic activity in humans. It is, therefore, only suitable for weight loss and slimming purposes. Clenbuterol is most commonly used in fat loss, pre-contest, and cutting cycles. When used for these purposes it promotes effective fat loss, allowing bodybuilders and athletes achieve a lean and ripped physique. But to achieve results, it must be accompanied by a healthy diet and fitness program. Clenbuterol does not burn fat directly, but rather increases body temperature, which, in turn, helps release triglycerides that are stored in the adipose tissue. These triglycerides are released as free fatty acids, which must undergo oxidation to produce energy. Because of this, users must cut their caloric intake and exercise more in order to facilitate fatty acid oxidation. Failure to do so could prevent the released fatty acids from being converted into energy and, thereby, inhibit fat burning. Clenbuterol is typically used in the 8-10 weeks leading up to a competition. Clenbuterol cycles can be run solitarily (on its own), or stacked with other compounds; but whether or not it is run alone doesn’t change the manner in which its cycles are run. It is utilized in the 2-weeks on/2-weeks off protocol, or for 8 constant weeks with the use of Ketotifen (a second-generation, non-competitive H1-antihistamine) every second week. 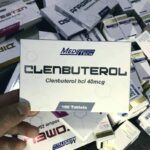 Clenbuterol must not be used for more than 12 weeks, since it can lead to severe side effects like irregular heartbeat, high blood pressure or cardiac hypertrophy. Individuals trying to use Clenbuterol as a weight loss and slimming aid should start with a smaller dose of let’s say 40 mcg per day and titrate up (“ramp up “) to 120-160 mcg per day. Females should aim for a range of 80-100 mcg per day. The dosage must be slowly titrated to these peak dosages. Users should avoid the temptation of making quick titration upwards, since this may cause problems. A slower steady increase in dosages actually delivers the most effective results. The best time of day to take genuine Clenbuterol for weight loss and slimming is in the morning. Dosages should be ingested once every morning. The compound has a half-life of about 37 hours and users don’t have to spread dosages throughout the day. Its effects can also be enhanced through the use of additional complementary substances. For example, thyroid hormone products, such as Cytomel or T3 slimming tablets, in particular are known to boost the fat loss benefits of this stimulator. When combined together, Clen’s thermogenic effect usually increase dramatically and this can be extremely beneficial for bodybuilders and athletes looking to lose weight fast. Such a mix also works great when using HGH or during a steroid cycle, where it can help one achieve a much harder look from the anabolic androgenic steroids. Lastly, taking massive doses of this drug is not recommended, as it can lead to health complications. So this beta-2 stimulator must be administered in reasonable doses, which actually produces the best results.